The Humanix group at Hiroshima University must be composed of terrible drivers guiltily suppressing memories of driving headlong into a crowd of children. 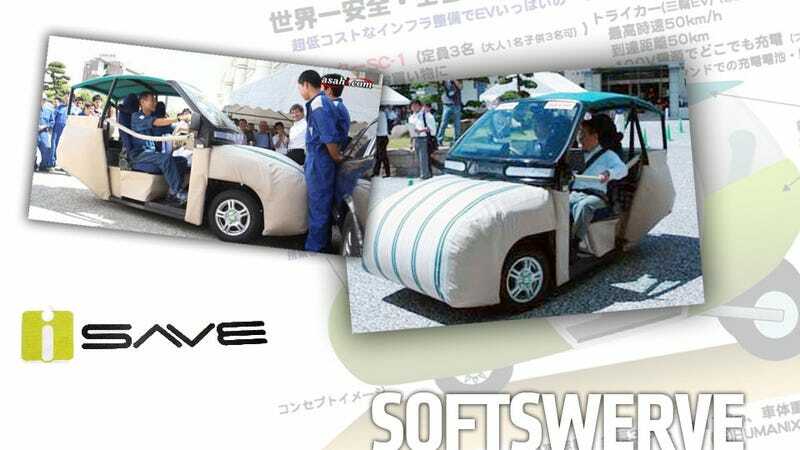 There's little else that could justify the development of their new electric car project, iSave, which is designed to be safer to pedestrians by being covered with what appear to be old mattresses. "What people do like is to drive around and not be guilty should they collide into dear friends." I guess I can't really argue with that. They're actually not old mattresses, but in fact advanced, hyper-strong, air-filled cushion units that just look like old mattresses. The car underneath all the padding is a 3-wheeled electric car that can go a meager 18.6 miles per charge at speeds of up to 31 mph. Oh, and it would cost only about $9300, a great deal if you avoid thinking about it too much. So, if you were in the market for a golf cart but concerned about your near-total vision loss and absolutely awful reflexes, you should be very pleased. The fundamental notion of creating a car that doesn't kill anyone when you ram into them is certainly admirable, but it's tricky to see why this is really that much different than, say bungie-cording a bunch of couch cushions and mattresses to a Nissan Leaf or something. They do say the car could be available in a variety of colors/patterns (slipcovers?) but the issue of how it will deal with prolonged outdoor exposure isn't clear. I'm assuming the outer material is weatherproof in the manner of outdoor furniture, but even those get moldy and smelly after a while. And, while you do eliminate the problem of scratches, you introduce the problem of staining. If I drop one of the two chili dogs I always keep on my person on my hood, it's easy enough to eat all the bits off and lick up the mustard. A cushioned hood, though? Better get the club soda. So, even though it suggests a world where a multiple-car pileup is as much fun as being drunk in a bouncy castle, I think I may take a pass on this one. But not until after I strap a couple of Craigslist free mattresses to my Beetle and give it a try.